Take 2 capsules daily, preferably in divided doses, with food. These elements, and particularly magnesium, are also essential for the proper functioning of the enzymes responsible for vitamin D metabolism. 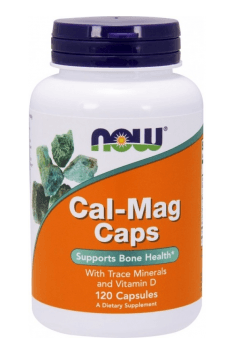 It is assumed that the most beneficial relationship between calcium and magnesium is 2:1. Both requirements, calcium and magnesium relationship and addition of vitamin D, have been met which makes the manufacturer composition a complex and effective element in the prevention of osteoporosis. There are many factors which can impair magnesium absorption, such as saturated fats, fibre, alcohol, strong coffee and tea, so it is worth to take the product with water and avoid consumption of the products mentioned above with the supplement.